Of the roughly 11 million undocumented immigrants in America, one in ten — or approximately 1.5 million — are from Asian countries. In other words, 1 in 7 of all Asian American immigrants are undocumented, and most arrive from countries such as India, China, the Philippines, South Korea, and Vietnam. Trump rode into the White House upon a populist wave of anti-immigrant xenophobia and nativism. The president’s pending dismantling of DACA is part of a larger political assault on America’s immigrants — both documented and undocumented. The rhetoric that the Trump administration has deployed against immigrants is one of intolerance against anyone foreign-born. To the huddled masses yearning to be free, Trump would rather build a “big, beautiful wall” than lift a lamp beside the golden door. The question now facing the rest of America: is this hateful and unwelcoming America the kind of America we want to live in? Or, do we draw our line in the sand here, with a vocal pledge to defend DACA and the rest of America’s immigrants, both documented and undocumented? Trump’s proposal to end DACA will not be official until he announces the decision on Tuesday. Furthermore, his rumoured proposal to end DACA would include a 6-month delay before the program is fully dismantled. That means we have between now and next Tuesday, and again between next Tuesday and March of next year, to ensure that DACA is not dismantled quietly. We have six months to make it be known throughout the streets of Washington D.C. that we stand with America’s immigrants, and that protections for Dreamers will not be removed lightly. Contact your Senator and your House Representative now. Urge them to pass comprehensive immigration reform, including legislation to provide deportation protection and employment authorization for Dreamers and other undocumented immigrants. Keep calling them once a week until it happens. You can also check out this Google doc with tweets targeting specific representatives, but remember that calling offices is better than tweeting. Join groups demonstrating RIGHT NOW in front of the White House to defend DACA and protect other undocumented immigrants. 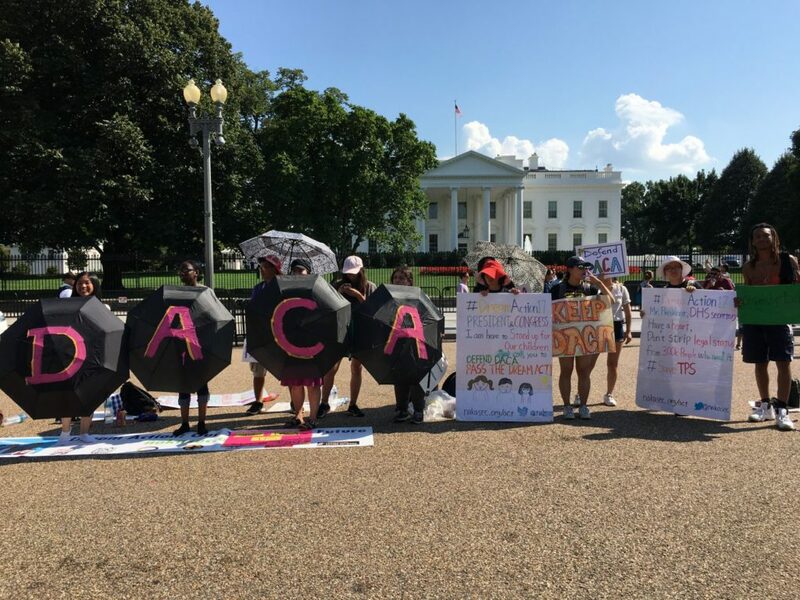 For the past week, I have blogged about NAKASEC’s 22-day, 24hr vigil in front of the White House demanding that the administration not end DACA or TPS. If you’re in the Washington D.C. area, now is the time to join NAKASEC and other immigrant advocacy groups in peaceful demonstration in front of the White House. Sign up to join the action in Washington on September 5 to Defend DACA, TPS and Immigrant Youth. Click here to sign up. Contact the attorneys general threatening Trump to end DACA. Here’s the phone numbers and twitter accounts (courtesy of United We Dream) for the nine remaining attorneys general threatening to sue the federal government. This tweet has a sample script. (Go to this Google doc for some pre-written tweets to use, but calling is always better than tweeting). Call the White House at 202-456-1111, or send an email to President Trump via this link. Let the president know you do not want him to end DACA. Tweet to #DefendDACA and retweet other folks’ tweets. Let’s break the internet. Do you have more actions? Please include them in the comments below and I will update this post. Correction: An earlier version of this post reported that there are nearly 30,000 registered Dreamers from Asian countries, however there is now some questions surrounding how to interpret numbers published in the USCIS report from which that tally was originally drawn. As such, this post has been corrected with a more conservative — but likely more accurate — number of at least 18,000 registered Dreamers from Asian countries. I apologize for any confusion.